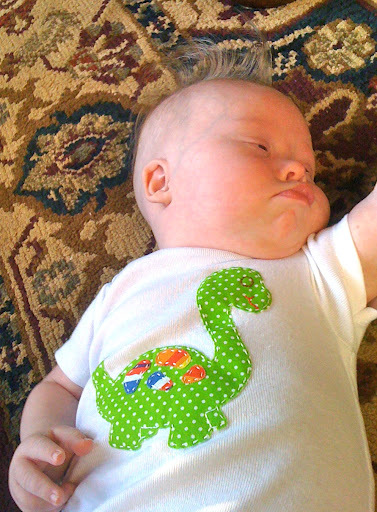 Remember when I posted pictures of the other kids in their dinosaur shirts? Well Daniel fits into his onesie now! We start the dinosaur obsession early around here. Also, I don’t intend to call Daniel Danny, but whenever I dress him in dinosaur stuff it makes me think of the “Danny and the Dinosaur” books. So cute! I love that onesie! Eeeek! Thanks for making your kids wear those shorts at least once for me. 😉 what a cutie! "Danny and the Dinosaur" was one of my very favorite books growing up. That one and "Ferdinand" about the kind bull.